Before I start, I just want to say thank you! I have had this blog for about two weeks and I've already had over 1.2K of views! I'm shocked and surprised that it has been this successful so thanks for all your support. If you have any ideas of what you would like me to do next, just comment below or message me! I would choose quite a plain skirt so then you can wear it with more things. Patterns are awesome but they can limit your outfit which you really don't want. My maxi skirt is from Primark for about £5. Although cheap, it can look quite expensive as the colour is white. Sometimes however white isn't the way forward as you can get loads of stains on the skirt so be careful where you sit! If you have decided to go for a patterned skirt then style it with a denim jacket and plain top. 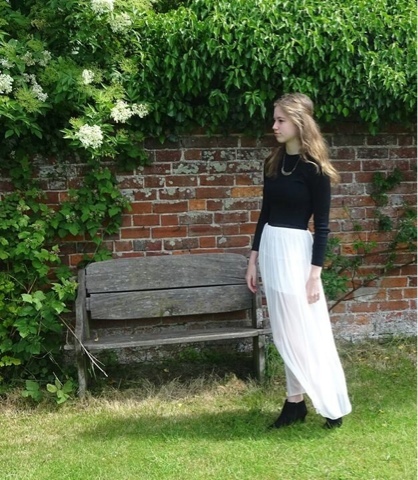 The style of the maxi skirt can range as shown in my photos. You can go for a grunge look or a girly look. This completely depends on your style. The grunge look is great because it isn't too gothic and gives the whole outfit a lighter feel because of the colour of the skirt. This look is great for spring and autumn as it keeps you warm as well. The girly look is sweet and summery. The white makes it a vibrant and outgoing look, whereas the pastel coloured hairband and the black help to maintain the colour balance. Contrasting the colour of the skirt with a bright coloured necklace can make it look quite sassy but I styled it with a bronze necklace to offset the black top but still keep the outfit really chic/classy For the second outfit I choose a flower garland instead to give a subtle colour difference. The boots are helpful as it prevents the skirt from trailing on the ground and also makes your legs seem endless. The other heels make it quite an elegant look. 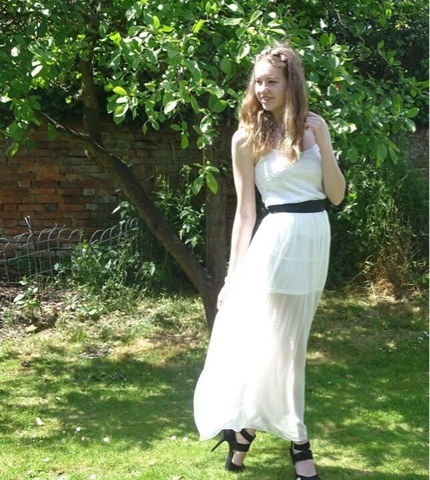 Would definitely recommend heels under a maxi skirt! Thanks for reading! I'll keep you all updated. Follow me on instagram @goudgee28! Shoutout to @loveyourlifeboutique! Like them on fb and follow on IG. They are about to set up a shop filled with awesome clothes and accessories. Loving their new magazine bags!